Talkin’ Trash: Architects and their clients turn to the next frontier in building operations—garbage. Although they are still rare in the U.S., the apartment buildings on New York’s Roosevelt Island have a single-stream system that has been in continuous operation since 1975. It has been expanded several times and now serves 12,000 residents in 16 buildings. By the middle of the next decade, the city could have another complex relying on pneumatic waste collection. Plans for the primarily residential second phase of Hudson Yards—the megadevelopment rising over rail lines on Manhattan’s far West Side—include a pneumatic network with dedicated tubes for landfill items, recycling, and organics that would connect to seven buildings with a total of 4,000 apartments. New developments can also provide resources that serve a much larger surrounding urban district. Clare Miflin, an architect and founder of ThinkWoven, a New York–based urban-ecology consulting firm, points to Ménilmontant, an 85-unit social-housing ­complex under construction in Paris’ 11th arrondissement. 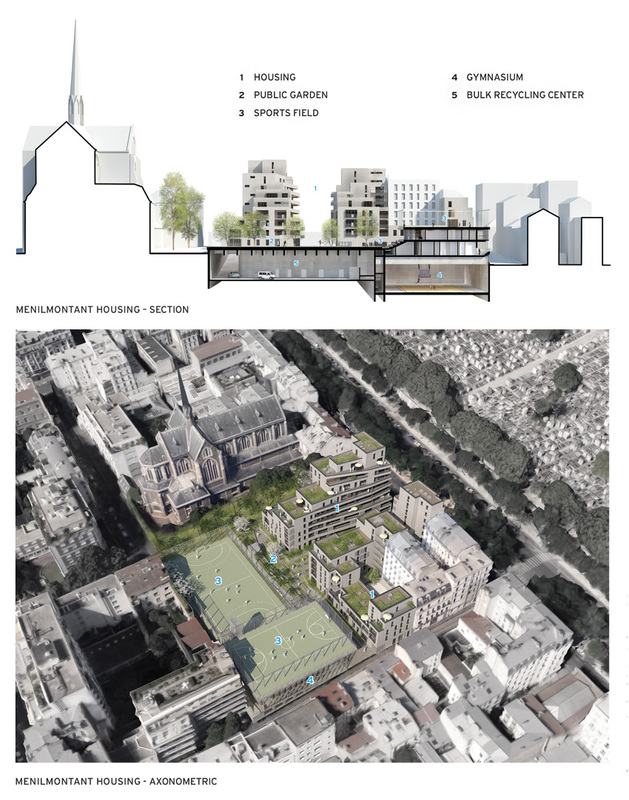 In addition to incorporating a community garden and neighborhood sports facilities, it will include a below-grade espace tri—a staffed facility that will accept items that Parisians are not permitted to dispose of at curbside, such as appliances, furniture, and household hazardous waste. As part of its long-range environmental plans, the city aims to establish such a bulk waste center in every arrondissement by 2020. Ménilmontant’s espace tri will be the first in a residential complex. According to Pierre Maurette, a partner at Vincent Lavergne Arch­i­tecture Urbanisme, the integration of the facility with the other neighborhood amenities was one of the reasons his firm was selected for the project. VISUAL AID As part of San Francisco International Airport’s zero-waste by 2021 initiative, Gensler designed new receptacles and graphics to be used throughout the facility to help increase sorting accuracy and diversion. Tools are starting to emerge that can help architects and their clients better manage the waste stream. Last year, AIA New York and a host of collaborators, including the Rocke­feller Foundation, published a set of Zero Waste Design Guidelines, a 270-page examination of commercial and residential building design, urban infrastructure, collection methods, and policy. Already the document is influencing design decisions. The guidelines helped persuade the project team for Sendero Verde—a 655-unit mixed-income housing project for the Harlem neighborhood—to include a second trash chute for recyclables, according to Lauren Zullo, director of environmental impact for developer Jonathan Rose Companies. The three-building complex, by Handel Architects, slated for completion in 2021, is targeting Passive House certification, but also has a goal of waste-stream optimization, she says. Another framework for the design and operations of facilities that minimize waste is the rating system TRUE, short for Total Resource Use and Efficiency. Previously known as Zero Waste Facility Certification, it was acquired two years ago by GBCI, which also oversees LEED and WELL (an occupant-health-focused standard). Similarly to those two systems, TRUE has a point-based structure and graded recognition levels, in this case Certi­fied, Silver, Gold, and Platinum. Minimum requirements include demonstrating at least 90 percent diversion from landfills, incinerators, and the environment, and submittal of diversion data annually to GBCI. BURIED TREASURE Paris plans to have a bulk waste facility, or espace tri, in every arrondissement by 2020. Vincente Lavergne Architecture has included one below a sports field in an 85-unit social-housing complex it has designed for the 11th arrondissement. Since Stephanie Barger, TRUE director of market transformation and development, maintains that the design of a facility “is absolutely critical to zero-waste success,” it is ideal for ambitious targets to be adopted early in the life of a project. But such commitments can also be made later, as was the case with Chou Hall, a 76,000-square-foot, six-story classroom building for the Haas School of Business at the University of California, Berkeley. 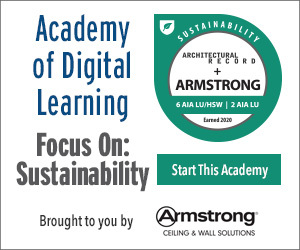 Designed by Perkins+Will, it is pursuing the certification trifecta of LEED, WELL, and TRUE. Although certification under LEED and WELL was decided upon during the design phase, the third rating system was added just a few months before opening, in August 2017. 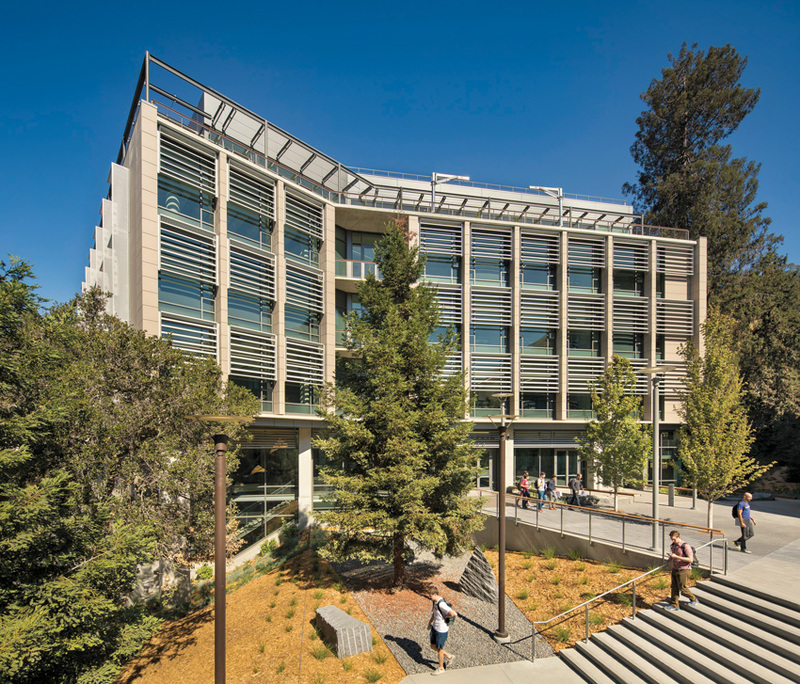 Administrators felt that Chou Hall should be the first TRUE-certified building on campus as part of the University of California’s system-wide goal for zero waste by 2020. “The idea was to create a blueprint that other Berkeley buildings could follow,” says Jessica Heiges, a master’s candidate in the College of Natural Resources, and one of the leaders of Chou’s TRUE-certification effort. Chou Hall has many advanced and integrated features for energy efficiency, water conservation, and health, such as a high-­performance building envelope, extensive daylighting, rainwater collection, and an inviting central stair to encourage students to forgo the elevator. Aspects of the design that should help with its TRUE certification include water-bottle filling stations and waste-sorting bins that are cleverly integrated into niches on each floor. But since formally adopting the zero-waste goal, the multidisciplinary faculty, staff, and student TRUE team has closely examined Chou Hall’s operations, establishing new initiatives that had not been part of the design brief. One area of particular scrutiny is the building’s café and the catering for its top-floor events space. “Food is the single largest generator of waste,” says Heiges. Some of the practices intended to shrink this footprint include collecting coffee grounds separately from other organics and sending them directly to a nearby farm; selling snacks from bulk containers, from which customers dispense the desired amount themselves into paper bags (to reduce the amount of uneaten food and eliminate plastic wrappers); and relying on reusable tableware and utensils for people who eat in and compostible ware for those who carry food out. TRIPLE CROWN Perkins+Will’s Chou Hall at the University of California, Berkeley, a classroom facility for the business school, is on track to be the first academic building to earn LEED, WELL, and TRUE certifications. But all of these initiatives require space for storage and equipment, which is at a premium, says Danner Doud-Martin, the assistant director of operations for Haas’s international business-development program and the faculty leader for the TRUE certification effort. “Real plates and dishwashing capabilities were just not in the plans three or four years ago.” Despite these space constraints, Chou Hall is on track to achieve both True Platinum and LEED Platinum, along with WELL Silver, which would make it the first academic building to be certified under all three systems. 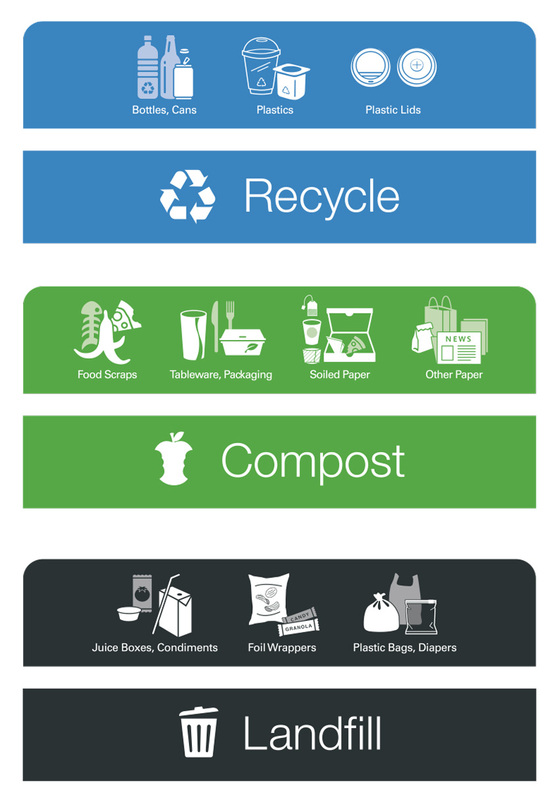 Such an intense focus on minimizing trash, like that exhibited by the Chou Hall certification team, may be relatively new, but it is an important aspect of building operations. TRUE’s Barger calls waste the “next frontier” in facility design. Let’s hope it is widely explored and embraced by architects and building owners. Getting to zero depends on it.